Nothing creates a stronger sense of "life" in wildlife art than realistic textures. 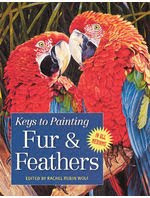 Here, top wildlife artists offer proven ways to paint fur, feathers and other realistic wildlife textures in a variety of mediums, including acrylic, oil, watercolor and pastel. Rachel Rubin Wolf is a freelance writer and editor. She is the author of The Acrylic Painter's Book of styles & Techniques and Painting Ships, Shores and the Sea. She is also the project editor for the Splash watercolor series, The Best of Wildlife Art, The Best of Portrait Painting and The Best ofFflower Painting 2, as well as many of North Light's Basic Techniques series paperbacks.